So, after getting increasingly petrified about this ultrasound over the past few days, I finally went in today to find out that everything... was fine. 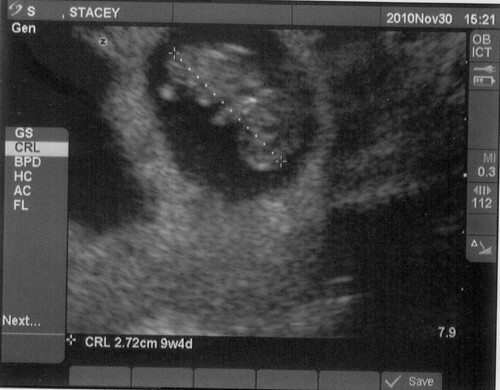 The baby measured right on target at 9w4d, with a heartbeat of 171bpm. While I was convinced last week that I had lost the baby, over the past few days I definitely hung onto that fear, but then also had this underlying feeling that everything was ok. I just didn't know which was the true gut feeling that I should actually listen to.... glad it was the good one. The other baby has nearly been absorbed already, which was sad but interesting too, to see nature just taking care of things. 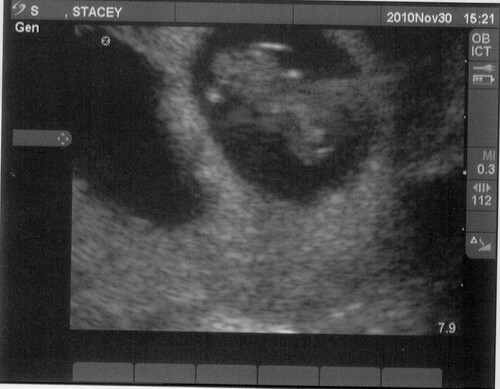 There was still a second gestational sac, but the ultrasound was only picking up a tiny dot of something within the sac, so it will probably be nearly absorbed by time I go in for my appointment next week with the high-risk doctor. And while I'm not even sure why I would still need to go to the high-risk doctor, I figure I might as well, 1) because my RE wanted me to, and 2) because that will let me have another ultrasound. If it weren't for that appointment, I likely wouldn't be having another ultrasound until my next appointment with my OB on 12/28. I don't understand how "normal" people can handle going so long between ultrasounds. It's still going to drive me crazy to have to go two weeks between the high-risk and next OB appointment, although part of that is because 13 weeks/Christmas is in the middle of that time, and it would make me feel better to have one last confirmation that everything is ok before we start telling everyone. While I'm not out of the woods yet with the risk of miscarriage, I just keep thinking that every day we make it lowers the risk just a little bit until I can get to the magical 13 week mark when the risk is around 2%. I know miscarriage still happens too often after that point, but since the odds aren't going to get any better than that, that's at least what the goal is to get to at this point. I believe this is referred to as the "gummy bear" stage... for good reason, I think. The baby is upside down, with a little arm bud sticking out on the middle left. The baby is still upside down, but this is straight-on, with the arm and leg buds showing up as the bright spots at the top and middle.